Korean little baby revived the popularity of Gangnam Style by the South Korean musician, PSY which hit billion views on youtube. 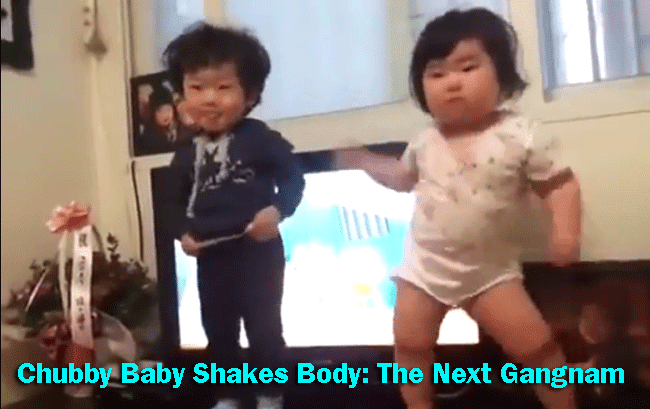 In the video, a chink-eyed baby together with her friend stood in front of a home video taken by a woman off cam. She adorably wiggled her buttocks and moved like crazy. Her moves were so amusing and entertaining. Her mother laughed hard and giggled at her encouraging how well she was doing. She might be attracting competitors with her moves or whatsoever but for now she won the heart of the spectators. Surely, she’d be the next Little Gangnam and would contribute another unique dance move for the year 2014. Her potential to be a dancer is quite great. She gained charisma through her angelic innocent face and cuteness. She has still much to show and would probably gain great popularity as much as Psy did in his version. Within 2 days, the video hit 3,362,766 views and still counting. Has anyone thought that letting such toddler exposed at young age over the net a good thing or the other way around? The pros and cons commented frankly regarding the video. They even mentioned about race and the physical disadvantages of being chubby or fat.